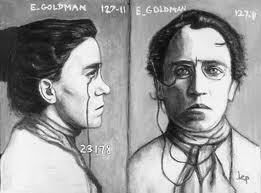 2 April, 2013 – What do people mean when they say “Anarchism”? Between the international Occupy movement, and questions surrounding capitalism, Anarchism has been a topic that has been much in the media of 2012. This seminar will introduce you to the philosophies of Anarchism through key readings, and then use these philosophies to discuss current events. This series of seminar sessions has been put together to encourage the exchange of ideas, experiences, and knowledge surrounding a particular topic or theme. 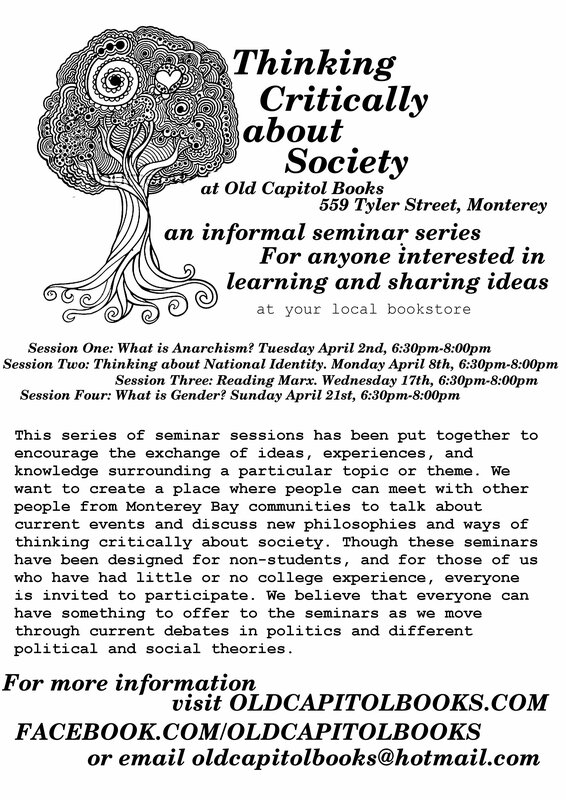 We want to create a place where people can meet with other people from Monterey Bay communities to talk about current events and discuss new philosophies and ways of thinking critically about society. Though these seminars have been designed for non-students, and for those of us who have had little or no college experience, everyone is invited to participate. We believe that everyone can have something to offer to the seminars as we move through current debates in politics and different political and social theories. Session 1: What is Anarchism? Session 4: What is Gender? What do people mean when they say “Anarchism”? Between the international Occupy movement, and questions surrounding capitalism, Anarchism has been a topic that has been much in the media of 2012. This seminar will introduce you to the philosophies of Anarchism through key readings, and then use these philosophies to discuss current events. The purpose of these seminars is not an attempt to “convert” anyone to a particular way of thinking, but to provide them with a wider range of experiences that may help them to see the world in a different way. We suggest that you read a few of the articles below, which have been some of the most influential on the subject, but you can read as many or as few as you’d like. Copies of all the articles below can be found on our webpage, or by visiting Old Capitol Books, 559 Tyler Street, Monterey. 1.) Howard Zinn – “Anarchism”. 4.) Peter Kropotkin, Encyclopedia Brtiannica, 1905 – “Anarchism”. 5.) L. Susan Brown – “Does Work Really Work?”, Kick it Over, #35. After you get a chance to do some of the background reading listed above, we’d ask you to start reading your local papers, and thinking about how the ideas of anarchism might relate to current events. Some questions to think about might be: How are power and systems of oppression relevant in this story or article? ; How are religious and ethnic minorities represented in this article? And how does this relate to power and government? ; How does this article talk about the police or prisons? ; How are prisons used to oppress one group more than another? ; How does power and hierarchy operate in our local community? ; or How can we thinking about the causes of homelessness? These are just suggestions, and we encourage you to bring your own questions and ideas to the seminars.